A Toronto officer purchased a shirt and tie for a shoplifter who tried to steal the outfit so he had something to wear to a job interview. 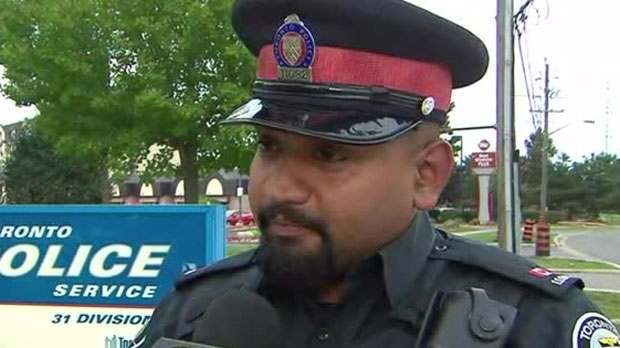 The staff sergeant of a Toronto police officer who purchased an outfit for a shoplifter commended the cop for his good deed. A Toronto police officer who purchased a shirt and tie for a shoplifter who needed an outfit for a job interview said he wanted to give the young man a second chance to get his life on track. Const. Niran Jeyanesan told CP24 Monday that he and his partner were called to a Walmart on Jane Street for a reported theft on Sunday night. When they arrived, he said the loss prevention officer at the store had apprehended an 18-year-old man for stealing a dress shirt, tie and socks. Const. Niran Jeyanesan spoke to CP24 about why he decided to buy a shirt and tie for a shoplifter at Walmart. After speaking to the shoplifter, Jeyanesan said he discovered that the young man needed the outfit for an upcoming job interview. “This young person has been facing his own difficulties in life and he was looking to straighten out all that by providing for his family and trying to get a job,” Jeyanesan said. After releasing the shoplifter without charge, Jeyanesan purchased the shirt and tie and gave the clothing to the man. “This individual didn’t have any resources,” Jeyanesan said. By purchasing the clothing, the 31 Division officer said he saw an opportunity to help the man. “Police officers do this every day and they don’t get recognized for it. We don’t look for any recognition,” he said. Speaking to CP24 Monday, 31 Division Staff Sgt. Paul Bois commended the officer for his decision. “I think the officer did a fantastic job. He exercised his discretion, definitely showed some humanity in dealing with this particular individual. Every circumstance is different and in this particular case the individual had undergone some personal difficulties and the officer wanted to help him out with that and I think collectively that’s why we are all here doing this job,” Bois said.